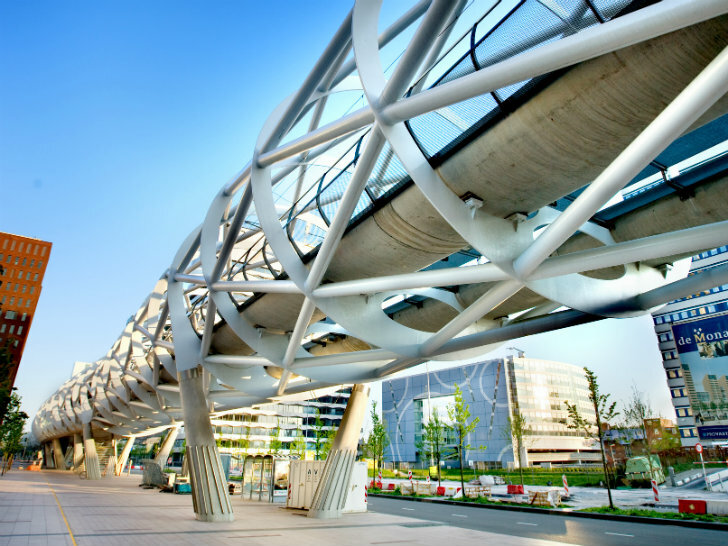 Beatrixkwartier is The Hague's newest light rail station for the RandstadRail that features an impressive design with a tubular space-frame. Elevated above the Beatrixlaan, a highway in the center of the city, the new urban light rail station acts like a viaduct transporting passengers to their destination. The 400 meter long Beatrixkwartier is constructed from steel and concrete, and was designed by Amsterdam-based Zwarts & Jansma Architects. 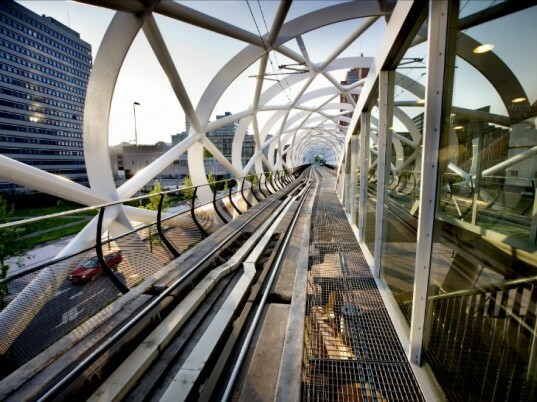 The Beatrixkwartier light rail station is one of the newest additions to the RandstadRail system, which connects passengers between The Hague and Rotterdam. The new station provides service for those working in the Beatrixkwartier office district and acts as a link between the tram viaduct at the Ternoot stop and the NS (Dutch Railways) railway embankment. Zwarts & Jansma Architects won a design competition back in 2008 for the project. Rather than fitting a station in at street level, it was decided an elevated station should not compromise vehicular traffic, visual sight lines or pedestrian safety. Zwarts and Jansma created an 400 meter long elevated viaduct with a station in the middle, which is encased in a tubular space-frame. The tube was prefabricated with a skeleton structure of rings of mild-steel strips with a diameter of about 10 meters, which were then interconnected by diagonally set tubes. This tube was then connected to the concrete rail platforms held aloft by V-shaped columns. The elevated station allows for two passing trains, and a space in the center accommodates platforms. At the passenger platform, glass panes are integrated into the tubular frame to serve as wind and weather breaks while still allowing for a gentle breeze and natural daylighting to pass through. The Beatrixkwartier light rail station is one of the newest additions to the RandstadRail system, which connects passengers between The Hague and Rotterdam. The new station provides service for those working in the Beatrixkwartier office district and acts as a link between the tram viaduct at the Ternoot stop and the NS (Dutch Railways) railway embankment. Zwarts & Jansma Architects won a design competition back in 2008 for the project. Rather than fitting a station in at street level it was decided an elevated station should not compromise vehicular traffic, visual sight lines or pedestrian safety. Zwarts and Jansma created an 400 meter long elevated viaduct with a station in the middle, which is encased in a tubular space-frame. The tube was prefabricated with a skeleton structure of rings of mild-steel strips with a diameter of about 10 meters, which were then interconnected by diagonally set tubes.